Absolutely riveting thriller inspired by a real-life case; I couldn’t put this down! I waited with baited breath to receive my finished copy after reading the initial excerpt, and I was not disappointed when I got the actual book in my hands. 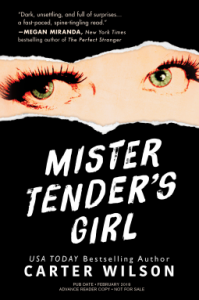 ‘Mister Tender’s Girl’ kept me riveted from start to finish; the tension, and gripping story just didn’t let up for the entire novel. The main character, Alice Gray (formerly Hill), has been victim to the atrocity of being attacked and stabbed by the Glassin twins, some 14 years ago now, and the crime was ‘encouraged’ by their fanatical attachment to graphic novels that Alice’s father wrote and drew about a character called ‘Mister Tender’. For many readers (and author Carter Wilson writes about this at the end of the novel), this will remind them of the real-life crimes spurred on by the Slender Man case. Alice now lives in a world where she has tried to run away from her terrible past back in England, where her father was also later attacked and killed, her brother has been diagnosed with mental illness, although her mother is pulling all the strings for him; along with all that, Alice gradually finds out there’s a whole online community dedicated to following Alice’s new life, obsessed with her struggle, and she comes to learn that the past is catching up with her. There’s now a ‘Mister Interested’ on her tail, and figures from her past are popping up, making her her terrible PTSD symptoms and panic attacks incredibly difficult to deal with, especially in her new life that she has tried to create; she now owns a coffee shop, and has dedicated time to make her body and mind stronger in response to her past. It seems her changes are not enough though, as she is living in a world of constant terror, anxiety, and fitful dreams. I feel like this is more than just a thriller though; it kept me glued to my pages for 2 days straight, as often as I could get reading time in, Wilson has done an excellent job in creating a character who has worked hard on herself and fights back against all odds, shows great tenacity, and although she is struggling with problems like PTSD, anxiety and panic attacks, she continues to rule out being a victim any longer. She also wants to have strong bonds with her brother and sees his struggle as well. I like that Wilson delved into the ‘scary depths’ of mental illness here because this was important to these characters. I know you have to suspend your disbelief about the cops becoming involved at certain junctures of the plot perhaps (I’m trying so hard not to reveal what happens! ), but the tension and drama in this book doesn’t let up and I was INSIDE this book all the way; it was written THAT well. For writing Alice as a survivor who decided to fight back after she became a victim, I say bravo. And for making it so that I forgot about about real-life scenario comparisons, extra kudos. I also enjoyed the writing tactic of taking the reader inside other worlds within the book successfully, without losing me in the least: the children’s story, the graphic novel, the past storylines, the dreams, the Internet chatroom, all very cleverfully employed. *Extra points for taking me back to Dover, England, where my dad lives. Overall, this was one enthralling suspenseful read, and just like I couldn’t wait to get this in my hands, I can’t wait to read what Carter writes next. I couldn’t get ENOUGH of this book, I just wanted more. That’s ALWAYS a sign of a good book. *Thank you to Sourcebooks and BookishFirst for my copy of the book. I actually slept on my first look of the book before writing this ‘impression’, and I haven’t been able to stop thinking about what I read. I also lapped up those first 30 pages (and kept swiping, hoping there was more on my Kindle, because I didn’t want it to end yet), because I was immediately drawn into the story that Carter has written. Alice is gripped in this world of anxiety and ongoing terror after what happened to her (and her father) so many years ago, and those feelings just emanate off those pages. I was immediately made to feel what she was feeling and because I love psychological thrillers in general, this just felt unique, with the graphic novel element, just jumping off the pages too. The writing was smooth and felt natural as Alice’s ‘voice’, and out of all of the ‘First Impressions I’ve read yet, this is the one that has pulled me in the fastest. Alice is haunted daily by her past, while trying to hide behind a veneer in a different world where no one really knows her, and now this ‘Mister Tender’ shows up?! I absolutely am dying to know what happens next and I would be honored to read and review an early copy of this thriller. It looks fantastic.